I have to confess I am a tumblr and wordpress fan and steer clear of facebook, twitter, insta etc. Still despite not having a personal facebook account I do maintain a page there for folk who find tumblr user unfriendly (!!). The page mainly links to wordpress posts. On instagram I had a couple of comments from life_in_a_saree regarding my Sparsh post, the post has been updated to reflect her comments (scroll to the end for comments). Just 4 years separate Kadambari and Sparsh but the former is firmly rooted in 70s styles while Sparsh gives a glimpse of the styles of the early 80s with barely a hint of the 70s. So let’s look at what the actors (mostly Shabana Azmi) wore. A heads up – given the DVD quality some of the screen captures are a little murky. Since Ms Azmi plays a widow most of her wardrobe is quite subdued. Her friend played by Sudha Chopra on the other hand is a little flamboyant while the men flirt with Indian “jholawala” styles now and then. Since the early part of this decade was very “ethnic chic:, Ms Azmi wears a lot of handlooms. A lot of these are quite specific to the time and not seen as often now. You could say that the kind of handlooms in style also change with each decade. The plain sari. The oatmeal coloured sari is probably some kind of raw/matka silk. Here it is teamed with an ikat blouse. The peach colour sari is probably a satin, teamed with a khann blouse. These in a way precede the plain satins of Arth, Silsila, Masoom etc. The time period of the movie seems to be autumn/winter so you see a lot of the little appliqued jackets from Gujarat in the film. The silk sari. For a couple of social engagements Ms Azmi wears silks. The id-ig of these proved to be the hardest. The white and black Kanjeevaram is pretty straightforward. The red and yellow I think is a Banarasi sort (one her character buys for the “feel”) though they lack the characteristic “bootis” on the body of the saree. In the third black and white sari, the motifs are a little unclear so it could be a Balucheri or a “South” silk (probably Chettinad, also the temple border suggests the south). This could be a cotton but the drape and movement seemed like silk to me. Then a couple of printed silks in earth tones. And last an elaborate border saree in white, red and green which I found hard to id (probably a Kanjeevaram). Almost all have very broad borders, as do many of the other sarees worn in the film. The Odisha saree. Despite varied colours and weaves the most common Odisha saree of the time was the one with a sandalwood colour base and a maroon ikat kind of border (as also the pasapalli). In the movie the sari is teamed with a maroon ikat blouse (which is also used for the printed silks). Ms Azmi also wears a simple rust coloured sari with a black ikat border. The Bengal saree. A lot of 80s movies have Bengal cotton saris, usually tant. These broad borders are no longer seen that often, indeed the tant as everyday wear (softening considerably with use) is also no longer common across middle class India. The South cotton. Broad borders and vivid colours. I think these are from Andhra. Assorted Saris. Ms Azmi also wears a mauve applique sari, a few light printed cottons, a few Kota kind of sarees, a synthetic sari of the Vimal/Garden sort and a patola border sari in white and red (which may be a silk). The winter wear. The aforementioned Gujarati applique jacket (sometimes quilted) and shawls. The black and red one is probably Kutchi. Nightwear, blouses, hairstyles: 80s nightwear was usually the maxi (here collared), which Ms Azmi again teams with the applique jacket (the movie certainly provides ten ways to wear a crop jacket!). The blouses are close necked and V necked with elbow length sleeves. A lot of the blouses are the “matching” plain sort but there are a few discreet mix and match versions. In most scenes Ms Azmi has a single plait but that casual knot while working reminded me of my mother. Sudha Chopra’s costumes: These have a upper middle class Delhi women of the 80s vibe. A lot of translucent georgettes and chiffons, a few muted silks, Punjabi suit sets but also a South (probably Chettinad) handloom witha dramatic temple border. Also glass bangles, a short crisp haircut and immaculate nails. What the men wore: When they wear Indian, mostly kurtas and shawls. A silk chudidar-kurta set for Amjad Ali Khan. And a few 70s touches as in the big collar shirts worn by the husband of Sudha Chopra’s character as well as the printed shirt of the little boy. There are a few sarees that are omitted but on the whole Sparsh gives a glimpse of early 80s middle class styles in India, albeit of the “arty” kind. Apart from the costumes, as always there is a glimpse of interiors (the sunken drawing room), rough ceramic crockery of the Morbi pottery sort, outdoor places like the Chinese restaurant etc that all remind you of the way things were. UPDATE: Some notes from life_in-a_saree via instagram on the sarees featured here. Since she is a “handloom geek” and ids almost all her saris, her observations and corrections are pertinent and welcome! That last Patola in the assorted sarees slideshow looks like a Pochampalli ikat silk for sure… So very pretty! And Sudha Chopra’s gorgeous red silk seems to be a zero Zari Kanjivaram. On the month of Asoja/Ashvin (September/October), extract from Indian Love Poetry. This year Ashvin begins on 23 September. The festival of Dussehra/NavaratriVijayadashami celebrates the nine aspects of Durga and is also often dedicated to the trinity of goddesses, Durga/Parvati, Lakshmi and Saraswati. Painting from India: Art and Culture, 1300-1900. I think this is the 17th-18th century Telangana wall painting style that harks back to Vijayanagara but can’t be sure as the picture lacks a caption. The saris are in the kaccha style and like many late medieval paintings the goddesses have different skin hues. I had an anon question on tumblr as an earlier question on wordpress that I will answer here together as they are kind of related. 1. I saw an early 19th century painting which showed women in a blouse and sari. I always thought blouse was introduced by Jnanadanandini Devi? But I think a formal kind of blouse, often influenced by prevailing Victorian fashion, and the petticoat worn with a sari did come in with the 1870s both in Western India and in Bengal. A few books of the time and later refer to shops selling “jackets”, which term seems distinct from the choli. The early 20th century Dhurandhar painting right on top shows differing blouse styles, from the indigenous choli to the modified choli with puff sleeves as well as more elaborate versions which are obviously Victorian in origin suggesting a variety of styles after the 1870s. In summary I think the sari blouse was around but not essential. Especially in the hotter areas of India where a sari sufficed. From the 1870s onwards, however, it became an essential part of attire for educated women and then all women. 2. Several months back I had a query regarding Jnandanandini Devi’s introduction of the Brahmika (Brahmo woman) drape from Sari Sisters. 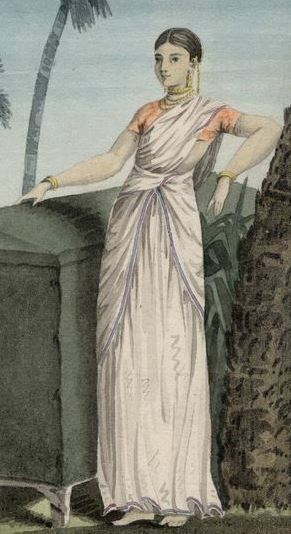 The query was on the difference between the Brahmika drape and Classical Bengal drape and whether the only difference was in the pleats on the shoulders. At the time I assumed that there wasn’t much difference between earlier sari drapes in Bengal and the Brahmika saree. But the question stayed in my mind and I had some time this weekend to poke around a bit. Not much came up. Though everyone agrees that the Brahmika drape was novel and inspired by the Parsi/Gujarati drape that Jnanadanandini saw in then Bombay, the exact nature of the earlier drape is not clear. Instead there is more emphasis on the introduction of accessories like the blouse, petticoat, hair net etc, which assisted in making the saree a dress for a bhadra (respectable) woman. Nevertheless there was some change since there are many remarks both on the untidiness of draping as well as the immodesty of previous drapes. The only clear reference I got was in Rochona Majumdar’s book (Marriage and Modernity) where she mentions that the traditional style is the pallu (end of the sari) wrapped around the waist or hanging in front rather than the pleats of the Brahmika saree. As it happens there aren’t too many pre 1870 pics that I could find except these. Rabindranatha Tagore’s mother on the left (presumably an older style, though it isn’t clear to me if the pallu is tucked around the waist and also on the shoulder). On the right a milkmaid of the 1840s, this drape has some resemblance to the Brahmika style but has no pleats and is simply wound around. The Parsi/Gujarati style is seen above which is the seedha (straight) pallu style with the sari being secured on the right shoulder. The Brahmika/Bengal styles are above. The style arranges the saree border in a way that mimics the seedha pallu (more evident in the left pic of girls in 1904*) but the pallu is eventually thrown over and secured at the left shoulder. So it does appear that the sari sisters were right in that process of pleating and arranging the sari in the upper part was probably different for the Brahmika saree (though some of the modern Bengal saree drape tutorials have a bit of a pleat arrangement in the bottom part too. Further the loose end can be thrown over the right shoulder). As always feel free to comment/inbox and do let me know if Bengal has more draping styles or if there are differences I missed. Today is Teachers’ Day in India. A piece on one of our first women educationists. The pics: Girls School at Jaipur :- The Primary Class (1950). An interesting mix of frocks, uniforms and sarees for the young students. Students of V year attend lecture by a professor of Radiology at the Lady Hardinge Medical College (1958). The images below are from IMSPIX. The initial images I downloaded a few weeks ago were not watermarked , subsequently they have watermarks. Merely posted for illustration and educational, especially given the pictures cover several decades. Obviously no copyright infringement intended. Students, 1936/1937. The odd frilled blouse as well as newer styles. A few seedha pallu style drapes, a good many “nivi” drapes. A mix of handlooms and prints. And coats of course. 2. Mostly Parsi girls in 1951* and Una Chaudhuri in 1951. 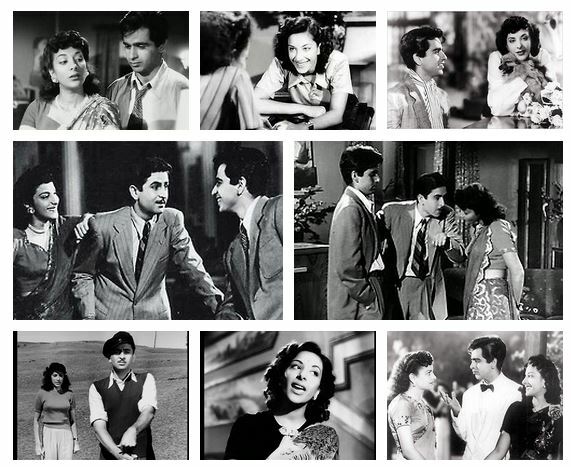 The blouses and saris on the seven girls are very 50s (plain, prints). Una Chaudhuri wears a printed sari with a border, with just the sari seen, the look could be from any decade really, especially 40s-70s. *Names listed as Dina Dordt, Piloo Mehta, Dina Daruwalla, Nergesh Motiwalla, Freany Vakil, Sheroo Mehta and Nergesh Kavarana. Which reminds me – Navroze Greetings! As seen here, in the early 60s simple silks replaced cotton/handlooms of the earlier decades and are often plain with a bit of zari or printed or with some kind of gold motif embossing. The women in the pic are listed as Nazli-Rafiya Fyzee, Preshy Rai and possibly Leena Lal. The six yard sari must have been extremely on trend in the 30s and 40s (and of course it was also the peak years of the freedom struggle which might have added to it) since it cuts across communities and regions in the country. The sari drape is the same, just presented a little differently with each subculture. On the left Zvia Epstein’s mother as a young woman, aged 19 (per my original notes, I think the link mistakenly identifies her as Zvia Epstein) in Karachi. From the piece as well as the attire I guess this is late 30s/early 40s. On the right a young Jewish woman in Bombay, 1948. Its an elegant studio portrait. The blouse and drape reminded me a little of Nargis in Andaz, which suggests it was the style then.